Google has launched a new microsurvey option, promising revenue-generating opportunities for online news organisations. The internet giant claims the data collection service could be an alternative to paywalls and ads. 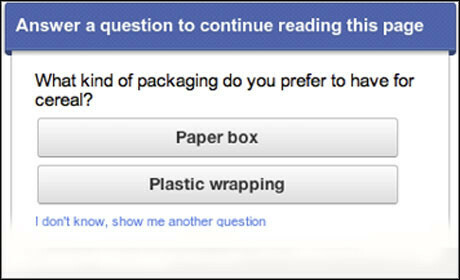 When a reader lands on the site they will see a box containing a question. In answering they are not sharing personal data but are providing information that Google can sell on to market research companies. In a blog post, which has a sample survey, Google states that customers have two options: to answer a market research question or "completing another action specified by the publisher (such as signing up for an account or purchasing access)". This provides news outlets with an additional option for collecting data, one option the Guardian is considering as a way to fund its journalism. On Sunday (March 25) Alan Rusbridger, editor of the Guardian, asked readers what they were prepared to give: time, money or data. According to Mashable, for every response sent to Google, publishers get $0.05. A number of publishers, such as the the Texas Tribune, the Star Tribune and Adweek, have added what are being called Google Consumer Surveys. Google describes the microsurveys as a "new business-facing product that makes custom market research easy". "It enables companies to ask questions ... and get back quantitative results quickly, accurately and cost-effectively. "Companies have already been using it to research everything from online shopping behavior (Lucky Brand Jeans) to gluten-free baking mixes (King Arthur Flour), and to assess brand awareness (Timbuk2) and inform product development (479 Popcorn). "Google shares the money these companies spend with our publisher partners."